Huawei Mate 20 series have been unveiled by Huawei on October 16, 2018 at an event held in London, United Kingdom. Apart from the triple camera, the most outstanding feature of Huawei Mate 20 series is the use of Kirin 980 processor. Built on a 7nm process, the Kirin 980 features two high-performance big Cortex-A76 operating at 2.6 GHz, two medium-performance big Cortex-A76 operating at 1.92 GHz, and four little Cortex-A55 operating at 1.8 GHz. It has a Mali-G76 MP10 GPU with a frequency of 720MHz. Equipped with strong hardware specs, Kirin 980 might be the most powerful SoC on Android ever. Its benchmark performance is worth anticipating. Today a new Huawei model codenamed“LYA-AL00”was spotted in Antutu database. This model is powered by Kirin 980 processor, and features 8GB of RAM and 128GB of internal storage along with a 40-megapixel main camera. Through the parameters, we can basically confirm that this model is probably Huawei Mate 20 Pro. After all, of all the available Huawei models, only Huawei Mate 20 Pro could possibly be equipped with the memory combination of 8GB RAM and128GB of internal storage. In terms of benchmark performance, this model gets a total Antutu score of 307,059 points, which is very close to the score of the suspected engineering device of Huawei Mate 20 exposed by Antutu earlier. 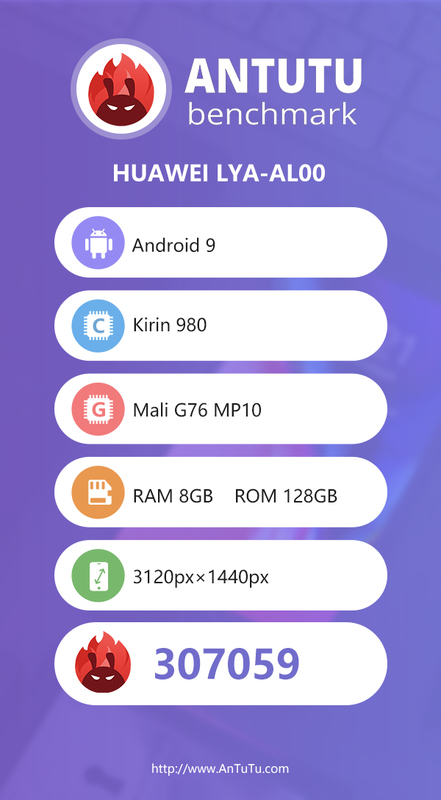 Therefore, it’s now almost certain that Kirin 980 processor is expected to score about 310,000 points on Antutu Benchmark, which is slightly higher than the score of Snapdragon 845 mobile platform.